OpenSCAD - The variable does not retain the changed value. The variable does not retain the changed value. How to assign a value to a variable? The dprovv1 variable seems not to keep the changed value. I do not speak English. I apologize for my english. Re: The variable does not retain the changed value. There are no variables in OpenScad, only named constants that have only one value for the whole of their scope. In your example you would need to do something like dprovv3 = dprovv1 + i; In general something that changes during a loop will need to be a function of the loop variable. This is a long overdue decision. But - Who is willing and capable to do so? I remember doug.moen doing this kind of thing to the manual, and he made a big mess of it until he finally learned how things fit together . . .
OpenSCAD sticks out of the CAD programs that I have tried because it is so easy to learn - until you get creative. Then rendering gets slow - very slow, indeed, and rendering times go up to become hours, not fractions of a second. I have learned by now how to speed up rendering about 50 000 times, i.e. to cut down 2 hour rendering to about 0.1 seconds. But to do that, you need to take into account hardware limitations, and not hide behind some lofty software design theory. In practical terms, I can speed up rendering about 100 times by moving from OpenSCAD to Free Pascal, by ditching any attempts at functional programming. If you want that kind of speed improvement for OpenSCAD, I am willing to show you how, and why ditching functional programming is a key to substantial speed improvements. Another key to speeding up OpenSCAD is reducing the amount of data that is cached - caching large amounts of data slows down program execution, unlike caching small amounts, which speed up execution. > This is a long overdue decision. > learned how things fit together . . .
insulting. Why do you think that's needed? care enough to fix it. Only changes will bring things forward. of the quoted part, I just want to say thanks Doug. > hide behind some lofty software design theory. with real life and constraints of the existing hardware. > caching small amounts, which speed up execution. OpenSCAD to Free Pascal, by ditching any attempts at functional programming." Can you show me an example of how to do this? What libraries would be used? > i.e. to cut down 2 hour rendering to about 0.1 seconds. > OpenSCAD to Free Pascal, by ditching any attempts at functional programming. computation done on the geometries that are the problem. No. Read the profile data for the execution. data because it dominates the rest. We know how to speed up OpenSCAD. It's just hard work. that OpenSCAD struggles with such as nice bevels and fillets. in the UI and work on it the experience simply doesn't compare. The attached file HelixSource.tar.gz contains the source code to create a helix composed of 200000 vertices and dump it on your hard disk as a 112 MiB .stl file. To compile it, Lazarus 1.6 is required. According to the Lazarus website, "write it once, compile anywhere" i.e. no special requirements regarding your operating system. Whether that is true I have not tested. Execution time on my system ( Intel Core i5-3470@3.4GHz, 4 CPU cores without hyperthreading, Level 1 cache size :4 x 32 kB, Level 2 cache: 4x256kB, Level 3 cache:6 MB shared cache, Physical memory: 32 GB, Operating system: 64 bit Kubuntu) is about 0.2 seconds, of which about half is used to render the 200000 vertices into 32 bit .stl format. Each vertex is calculated using 80 bit floating point numbers, with a 64 bit mantissa. I have tried to use 64bit fixed precision format until I realized that rounding errors cannot be avoided this way, since part of the work is calculating the length (norm) of vectors, which would require 128 bits if the result were not to be rounded. The .stl data are 32 bit floats, in line with the .stl spec. Execution times are quite variable, in line with what to expect if caching is the main contributor determining execution speed. 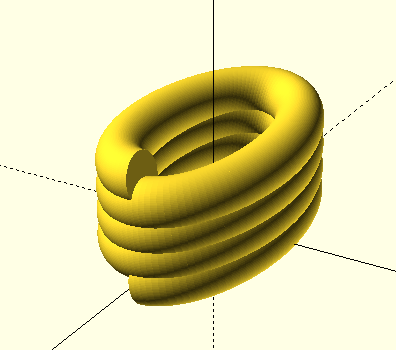 Compare the 0.1 second true rendering time under Free Pascal / Lazarus with the 11 seconds rendering consumed when following the same programming strategy in OpenSCAD (shared in re: improve rendering speed, 9 June 2016, this forum, or the nearly 2 hours OpenSCAD requires for rendering if the helix is constructed from spheres, or the one hour if constructed, following parkinbot, from thin slices joined by hull(), or the 20 minutes it takes to render parkinbot's helix implementing a suggestion by Ronaldo how to produce slices of zero thickness. Compare these speed increases also with Alan Cox' claim that parallel execution does lead to major speed increases. My system has just 4 cores, and if each core is fully utilized, I may expect a speed increase of somewhere between 2 and 3 times, not more. SSE instructions, allowing 128bit data, are useful for vectorizing 32 or 64 bit floats, with another 4 resp. 2 times speed increase. I use 80 bits, and cannot use them at all. I presume I have demonstrated that I know what I am talking about? By the way, if you decide to go to the trouble and compile my program, load the resultant .stl file into both OpenSCAD and MeshLab and try to rotate it. Which program is still usable with files of this size? This concludes part one of what I have to say, about speed increases that can be expected if functional programming is officially ditched. Part 2 will show that functional programming has, in version 2015.03-1, already been ditched - inofficially. It is just that the key people have not realized it. This piece of code first changes the content of a variable and then echoes the last entry into the list. More sophisticated versions of this design could be used to construct a library that allows transparently to execute imperative code in OpenSCAD, with the compiler none the wiser. And if you read FirstList from an external file, you have input/output facilities for OpenSCAD. Not convenient and rather roundabout? I agree wholeheartedly. But it is possible . . .
Control routines, i.e. when to skip line 4, I have omitted, as they are not essential to my argument. The distinction here between imperative and functional programming is that for imperative code, line 3 is optional and the compiler does not enforce its presence. But for true functional programming, each memory location can accept a value only once and thus, each intermediate result needs to be saved. This in turn says that functional programming burdens the CPU with more work, and that means the CPU is slower. You can, of course, permit the compiler to be more lenient and not store every intermediate result. But that is fudging the issue . . . As it does speed up program execution! If all three memory locations are in my level 1 cache, each Assembler instruction will take one clock cycle and the whole lot just over one nanosecond on my machine. But if they are not in level 1 cache, the cache controller will require time to fetch it, from level 2 cache, if it is there, from level 3 cache, if it is there, from general memory, if it is there, from the hard disk cache, if it is there, and if the data are nowhere to be found, from the swap file on my hard disk. Since that turns at 7200rpm, data read rate is 7200/60=120bit/second/read head. This means there is speed differential between data from the fastest memory location (=cache) to the slowest of about 1 in 10 million! And again, details like latency I have not considered, as they only lower speed even further. What I have observed is that speeding up by a factor of 70000 (2 hours /0.1 seconds) is possible, not all of it originating from imperative vs functional coding style. So far, I can assign only a factor of 100 to it, from 11 seconds to 0.1 seconds. Since you have asked for it, libraries I do not use at all, if I can possibly avoid it. Coding speed is not an issue for me, understanding what I am coding, and why, is. And therefore, I take issue with people who provide misleading answers, people who waste my time, and that of others. Code that I write is unlikely to ever leave the level of experimental code. That is good enough for me. But what I learn from writing this code I share with those who care to listen, and only them. Where is the reassignment to a variable in your example? You just made a second list that is the sum of pairs of the first list. No list contents were modified. Just because a functional language doesn't allow reassignment it doesn't mean that the compiler can't reuse memory. In fact compilers for imperative languages often create an intermediate code that produces a new symbol for each assignment and then allocates and re-uses registers and memory the most efficient way it can. The result bears little relationship to the source code. imperative code in OpenSCAD, with the compiler none the wiser. that is fudging the issue . . . As it does speed up program execution! those who care to listen, and only them.